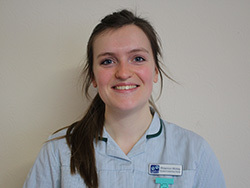 Rhiannon is our Student Veterinary Nurse. She owns a Ragdoll cat called Percy who is very cheeky and rules the house! Previously worked as a dog groomer for 5years before coming to Upton vets and working as a kennel assistant in March 2017. Rhiannon really enjoys working at Upton Vets especially caring for all the different animals that come in, working with the friendly staff team and meeting all the customers. Enjoys walking on the beautiful Purbecks, baking, sailing in Poole harbour and skiing with her family and friends.